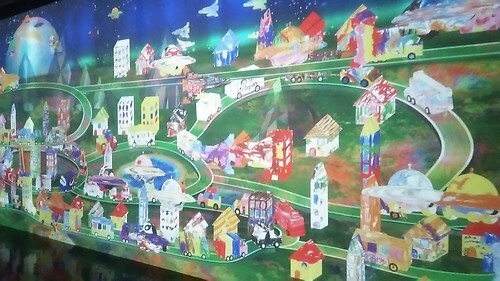 Japanese children paint cars, trucks, aircraft, including UFOs that then scanned into, and bounce or fly along in, a giant musical city scape traffic jam mural, with which the children can interact. The vehicles are ticklish to the tap. The Japanese children, including my own, go wild because they too are one with the fish: images come to life. Esse est percepi. Video ergo sum. Before going home the children can have their pictures scanned into onto 3D paper model that they can fold into toy. Their pictures become alive and dwell amongst us. and the production company's explanation is here.